It is 4 mils thick (metallic center reflective layer). It will provide 100% Optical Clarity. The 4 mil construction is durable. It has a scratch-resistant coating (room-side only). Neutral bronze or black will not change the way colors appear. 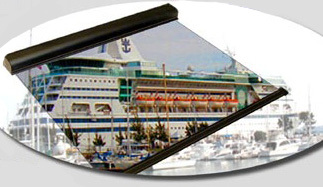 Approved by the Coast Guard for use in merchant and cruise ships. We also offer a complete line of 3 & 4 mil shade materials with gold or silver back.